Just a quick note to say thanks for putting in all the effort it takes to keep this blog going, I only discovered it about a month ago and am now a regular. 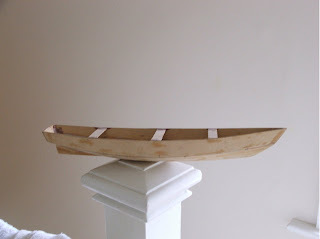 Enclosed are some pics of my rowing boat. I designed and built her over the winter 2006/7 so she’s not a new launching. The idea is a safe coastal rowing boat, taking inspirations from John Welsford’s Joansa, Bolger’s Light Dory and Paul Garside’s flash boat specifically, plus ideas from a few others in John Gardener’s excellent Building Classic Small Craft. 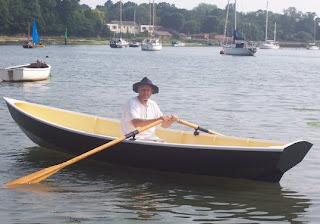 I live in Bursledon so I wanted to be able to row out into the Solent which can be choppy and has the additional hazards of very heavy motor boat wash. The design process was very enjoyable and pretty straightforward. Starting with rough lines, I built a half model – thanks go to Sam Devlin for his chapter on making chine models (Devlin’s Boatbuilding) it's really easy to go from drawing to half model which gives a much better feel for the design. With some adjustments I proceeded to a full model in 1mm ply which was built stitch and glue (fuse wire and superglue) to prove the construction and panel shapes. With spreadsheets even Stimpson’s rule calculations are pretty quick and easy, but I have to say I didn’t bother with this one. We did “tank test” the model in the bath, weighted with coins to see how she tracked and how it responded to “waves” – all very unscientific but it did give me some confidence we were on the right track. Construction is 4mm ply with 9mm for transom and frames, the gunnels are some cheap pine, she went together very easily the 6 panels stitched up, transom fitted and a couple of cross braces to form the shape while the first epoxy tapes were put in. Once the hull was reasonably stable frames were measured and fitted accurately as were stern and stem compartments, breast hooks etc. Finish is painted in workboat tradition (I have enough varnishing to do on my other two boats). The build came in pretty light as intended (under 100lbs) and she floats pretty much as intended with one person rowing, if a little tender initially. I wheel her down from our house to Swanwick hard on the launching trolley (about 400 yards) so the light weight is important, especially going home after a long row. Two up or with a small load she’s very stable. Rowing long distances is easy and relaxing. All in all I’m pretty pleased with her. The picture above is launch day of Swanwick Hard. I’ve since moved the seat forward 3” which trims the bows down slightly and increases directional stability. In windy conditions I carry a 5 litre water container forward to keep her tracking (advice from John Welsford – apparently its a dory quirk). I guess we ought to think about joining the HBBR, the trouble is fitting everything in. If you or any of the members are planning to an outing to Bursledon or the Hamble please drop me an email it would be nice to row in company. And so you shall! The Dinghy Cruising Association is cruising up the Hamble this weekend, and several Home Built Boat Regatta members will be there, including me (weather permitting!). Organization is flexible (some say non-existent) but the group will be foregathering at Swanwick Hard at about 10.00hrs on Saturday, heading upriver to the Horse and Jockey at Curbridge for lunch. The group will meet in the evening in the Jolly Sailor in Bursledon. Sunday will probably be spent out in Southampton Water.